We only just saw the iPhone 7 a few months ago, but already the iPhone 8 concepts are piling up. It seems everyone with a flair for design has an idea for what Apple should do with its next smartphone. The concept includes the Touch Bar, which Apple just released recently on one of this year’s new MacBook Pro models. The Touch Bar is essentially a thin bar sitting across the top of the keyboard on the MacBook Pro. It provides easy quick access to whatever functions are assigned to the Touch Bar. The Touch Bar itself is a multi-touch Retina display that changes depending on what the user does inside of the app he/ she is using. 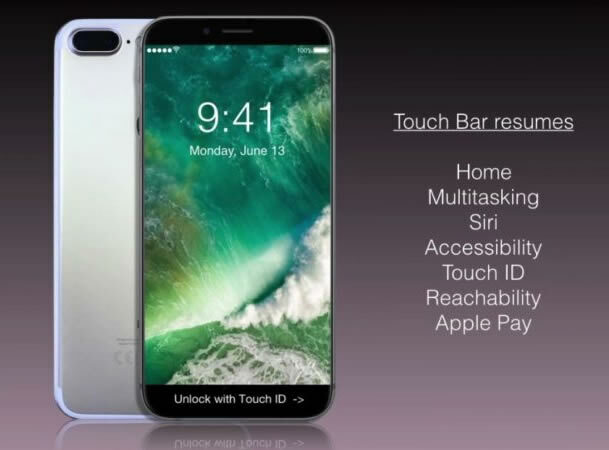 In addition to adding a Touch Bar, the iPhone 8 concept in the video features an ultra-thin design, which is certainly Apple-esque. It also replaces the Lightning port with a Thunderbolt 3 port, enabling faster charging and transfers of up to 40 gigabytes per second. The concept is also nearly bezel-less, a rumor we’ve been hearing related to the iPhone 8 for quite some time. On the other hand, it could work, with one tweak. Samsung’s Galaxy S8 Edge phones have been a huge hit, and they have bars on the curved edges that offer quick access to apps. There have been rumors about Apple releasing a curved iPhone for some time, so maybe not a Touch Bar, per say, but maybe something more like an Edge screen, although that would seem like an obvious Samsung rip-off.